Partners from HPE joined NREL and DOE to celebrate NREL's new 8.0-petaflop supercomputer, capable of carrying out 8 million-billion calculations per second. Photo by Dennis Schroeder/NREL.8 Jan 2019 Washington, D.C. - Now in production use, the ultra-efficient Eagle high-performance computer will power scientific insights to accelerate the U.S. energy system transformation. The U.S. Department of Energy's (DOE's) National Renewable Energy Laboratory (NREL) already had the world's largest supercomputer dedicated to energy efficiency and renewable energy, Peregrine - but with its replacement system, Eagle, the laboratory's computing capability has more than tripled. This means considerably more power to help NREL scientists advance R&D across the spectrum of renewable energy and energy-efficiency technologies. The new system is the latest development in a long-standing partnership between Hewlett Packard Enterprise (HPE) and NREL to find innovative and energy-efficient supercomputing solutions. 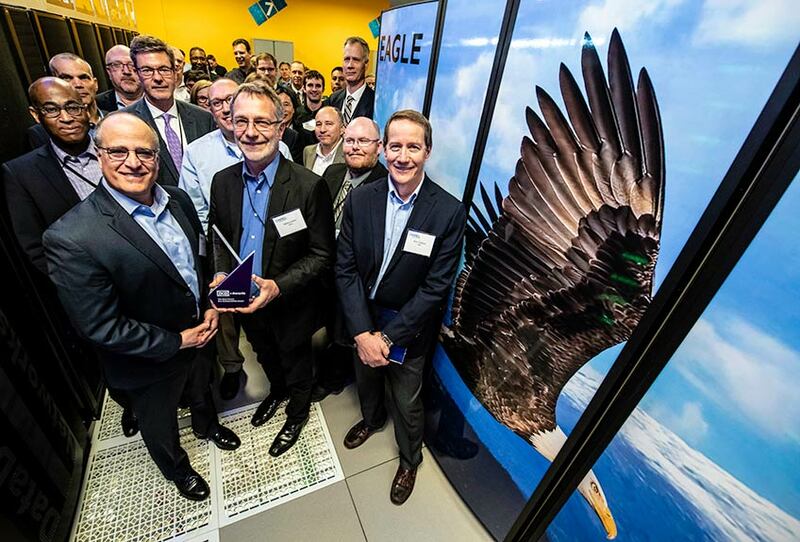 Representatives from HPE joined NREL and DOE to celebrate the new system at a January 8 ceremony at NREL's Energy Systems Integration Facility (ESIF), which commemorated the official launch of Eagle for production use. Not only does Eagle - with a peak performance of 8.0 petaflops, meaning it can carry out 8 million-billion calculations per second - drastically increase NREL's computing capability for renewable energy and energy-efficiency research - the system itself is energy efficient, too. Eagle features a warm-water liquid-cooled design that was originally developed for Peregrine in partnership with HPE - a concept that has become standard for other data centres. The system is designed to capture 97% of the supercomputer's waste heat, which can then be made available for use throughout the building in which the system is housed. At the ESIF, the heat captured from Peregrine and Eagle is reused in office and lab space. The successful demonstration of this innovative approach has led, in part, to two recent honours for the ESIF data centre: a Federal Energy and Water Management Award and the prestigious 2018 Data Center Dynamics Data Center Eco-Sustainability Award. "This is a really exciting time for high-performance computing at NREL", stated Computational Science Director Steve Hammond. "The global recognition our data centre is receiving cements its position as the most energy-efficient data center in the world. And now, with Eagle up and running, we're poised to deliver more scientific insights than ever before to advance our nation's energy transformation." NREL researchers have smart, bold questions about transforming our energy system. Eagle is helping them find the answers faster.